Prior to Android Nougat, you can only change the font size for the display. But such font settings are not respected in some screens, for example, lock screen keypad and notifications do not follow your font settings. As a new feature in Android Nougat, you can now set display size, which can scale all display elements including icons and images. You can change the default display size in Settings— Display — Display size. Please follow this guide on how to use display scaling in Android Nougat. Automatically blocking spammers and other unwanted callers is one of the most requested features in stock Android. In the past, you can use an app to block unwanted calls as explained in this guide. Now, Android Nougat update for Moto G4 supports call blocking natively in phone app. To enable call blocking, you need to start dialer app (Phone app), tap the menu icon (3 vertical dots) in the top-right corner, tap Settings, then tap Call blocking. Please read this guide on how to use call blocking in Android Nougat phones. Data saver is a new feature in Android Nougat to help you reduce mobile data usage. It replaces an old option called restrict background data in stock Android. When data saver is on, apps running in the background won’t be able to access mobile data. An app that you’re currently using can access data, but may do so less frequently. You can also choose which apps have unrestricted mobile data access. You will see the data saver status icon in the status bar when data saver is on. By default, data saver is off in Android Nougat update for Moto G4. To turn this feature on, you need to go to Settings — Data usage — Data saver. Please follow this guide on how to use data saver in Android Nougat. Another long-awaited feature of stock Android is the separate wallpaper for lock screen and home screen. Android Nougat update for Moto G4 allow you to have different wallpapers on Home screen and lock screen of Moto G4. 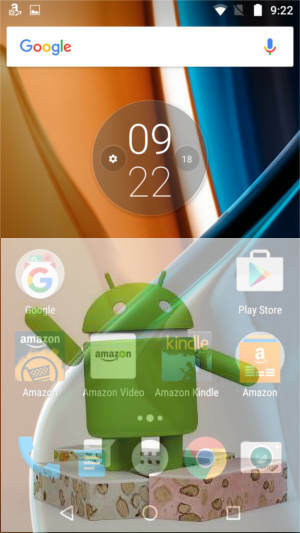 You will be prompted to set the selected wallpaper for the Home screen, lock screen or both when settings wallpapers on Moto G4. In addition to the quick settings buttons, now Android Nougat update for Moto G4 added a a new settings bar at the top of the notification shade. This makes it easy for you to access some quick settings when reading your notifications. Please follow this guide on how to use quick settings bar in Android Nougat. Android Nougat update for Moto G4 allows you to rearrange the quick setting tiles. To rearrange the quick setting buttons, you can swipe down from the status bar with two fingers, then tap Edit at the bottom of the quick settings panel. Please check this guide on how to customize quick settings panel in Android Nougat without through system UI tuner. One of the signature features of Android Nougat is direct reply in notification shade. You can quickly reply to messages directly from the notifications. When you receive a message, swipe the status bar down and tap Reply on the message notification. Then type and send your response without opening the app. Android Nougat udpate for Moto G4 also brings bundled notifications. In Android Nougat, multiple notifications from the same app are bundled together into a single notification group. Drag the status bar down and tap the group to expand it and see or take action on individual notifications. To use these new notification features in Android Nougat update, you may check “How to use new features of Android Nougat notification panel: bundled notifications, directly reply and notification control?“. Did you try these top 10 new features in Android Nougat update for Moto G4 and Moto G4 Plus? If you have questions or encounter any problems with new features in Android Nougat update for Moto G4 and Moto G4 Plus, please let us know them in the comment box below.